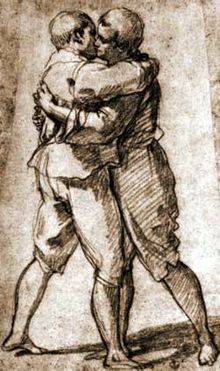 To clasp (someone or each other) in the arms with affection; to take in the arms; to hug. Enclosure, (partially or fully) surrounding someone or something. First-person singular (yo) present subjunctive form of embrazar. Formal second-person singular (usted) present subjunctive form of embrazar. Third-person singular (él, ella, also used with usted?) present subjunctive form of embrazar. Formal second-person singular (usted) imperative form of embrazar.